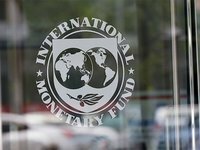 The International Monetary Fund (IMF) has improved the assessment of the deficit of the current account of Ukraine's balance of payments for 2019 to 2.5% of GDP compared to 2.9% of GDP in its previous forecast dated December last year and 3.7% of GDP last year. According to the updated World Economic Outlook (WEO), the assessment of the current account deficit for 2020, on the contrary, is somewhat worsened: to 2.4% of GDP from 2.2% of GDP. According to the fund, in 2024 the current account deficit will remain at about the same level at 2.6% of GDP. The IMF confirmed its forecast for Ukraine's GDP growth for this and next years at 2.7% and 3% respectively, expecting acceleration in 2024 to 3.3%, which corresponded to the growth rates in the past year. According to the updated WEO, the fund, like in December 2018, expects a slowdown in inflation in Ukraine from 9.8% last year to 7% in the current one. For 2020, the inflation estimate is somewhat worsened: to 5.6% from 5.5%. In addition, the IMF predicts a decrease in unemployment in Ukraine from 9% in 2018 to 8.5% in 2019 and 8.1% in 2020, while in December 2018 the forecast for this and next years stood at 8.6% and 8% respectively.